The decision follows reports in the US and South Korea of the phone "exploding" during or after charging. "There was a tiny problem in the manufacturing process, so it was very difficult to figure out,'' the president of Samsung's mobile business Koh Dong-jin told reporters. "It will cost us so much it makes my heart ache. Nevertheless, the reason we made this decision is because what is most important is customer safety," he said. This is an extraordinary decision for a tech giant to make based on so few reported incidents - Samsung says it is aware of only 35 cases worldwide. It's bad timing so soon after a big product launch and especially given that Samsung's rival Apple is understood to be preparing to unveil a new iPhone. People who have already bought the device - which is only available to pre-order in the UK - will be issued with a replacement. Stories about exploding smartphone batteries do make the news from time to time - lithium ion batteries are flammable but very widely used. A YouTube user uploaded a video under the name Ariel Gonzalez on 29 August of a Galaxy Note 7 with burnt rubber casing and damaged screen. He said the handset "caught fire" shortly after he unplugged the official Samsung charger, less than a fortnight after purchasing it. A user wrote: "There was another explosion of the Galaxy Note 7. It was my friend's phone. A Samsung employee checked the site and he is currently in talks over the compensation with Samsung. You should use its original charger just in case and leave the phone far away from where you are while charging." 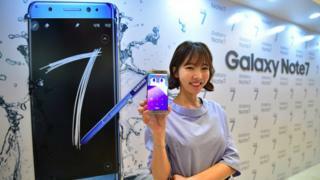 The Galaxy Note 7 model is the latest of Samsung's series of so called phablets - smartphones with very large screens. In July, Samsung beat expectations with record earnings in the latest quarter with strong smartphone sales helping the firm post its best quarterly results in more than two years.